Inspired by the enthusiasm our website readers had for our activity suggestions, we’ve compiled 250 new and favorite activities and organized them by baby’s age. We hope our blog readers will give this diaper bag-friendly book to their pregnant non-bloggy friends. ParentHacks.com: The fact is, this is the perfect book for new mom who’s just starting to regain her senses; the one who is ready to brave the suddenly bright/noisy/crowded world with her newborn tucked into the front-carrier. 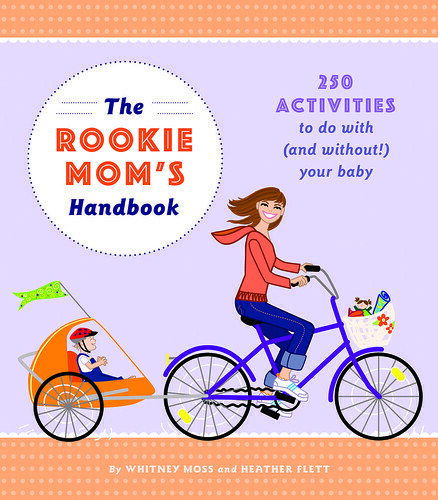 The Poop, SF Chronicle Baby Blog: “The Rookie Mom’s Handbook” is like the baby bible for exciting, creative activities as your newborn slowly turns into a toddler. Written by Berkeley moms Heather Gibbs Flett and Whitney Moss, the handbook is loaded with fun, easy ideas for turning the average day with your baby into something more enriching or, if you desire, maybe something just a little less mind-numbingly boring. Red Tricycle, pint-sized news for savvy grown-ups: The book is filled with playful and useful tidbits (sized so that new moms can read them during, say, a 3 a.m. feeding) for what do to with little ones from zero to twelve months. We love the guide’s focus on maintaining your womanhood once you’ve entered motherhood. Should be required reading for all PEPS/new moms groups.